This time last year, I did a reader’s survey (those of you who have been reading a while might remember it). One of the questions I asked was about whether you’d like to read more reviews of restaurants outside Reading, and if I remember there was some enthusiasm but not masses. I asked the question again on Twitter this week and again, the response was mixed. Lots of you said you’d rather read reviews of places in or near the town centre, some of you said you were prepared to travel for good food. But “good” is the operative word, and whenever I head out of town only to eat something mediocre I always wonder, as I’m writing the review, who is really that fussed about reading it. Nobody writes postcards, after all, saying Having an indifferent time, you’re lucky you’re not here (and yes, I know nobody writes postcards full stop, these days). For what it’s worth, I’m generally with the town centre brigade. When I go out for dinner, especially at the weekend, I like to be able to have more than a solitary glass of wine. And that means that if you can’t get there easily, by bus train or taxi, I’m never entirely sure I can be bothered. So restaurants outside Reading only truly draw me in if they have something about them – a menu full of twists and invention, an ethos that jumps off the screen when you look at the website, or because they do food you simply can’t get anywhere else. And that’s why we’re in Windsor this week, because Al Fassia is a Moroccan restaurant and I’ve been looking for one of those for a very long time. This isn’t the time to bore you all with my second-rate travel writing (it would be like sitting you down and showing you holiday snaps from some time ago), but I bloody love Marrakech. From the bustle of the medina, dodging bikes and mopeds, to the brightly-lit, hyper-real cacophonous madness of the main square, from the strange dusty faux-French boulevards and grand cafes of the new town to the winding, chaotic lanes of the souk, it has to be seen to be believed. I have lots of happy memories of sitting outside Café des Epices drinking lemonade, playing cards and watching the traders trying to sell some of the ugliest woolly hats I’ve ever seen (honestly, in the height of summer). And the food! That exquisite combination of savoury and sweet, meat and fruit and spice, sampled on roof terraces and in merchant houses, candlelit on those long balmy evenings. I grant you, probably not easy to recreate in a little Windsor restaurant not far from the arts centre, but on the offchance that Al Fassia could, how could I resist trying? So we arrived one weekend evening to put it to the test. Our first mistake was turning up so early – foolishly, we’d booked an early table to allow for the train trip home. It meant the place was almost empty. The downstairs room was quite sombre and muted, plain tables and chairs, proper cloth napkins and plates with the restaurant’s palm tree logo, the wooden panelling along one wall the only real concession to Morocco. Upstairs – which wasn’t open the night I went – is very different with shuttered windows, rugs on the walls and those beautiful twinkly pierced metal lights (never let it be said that I lack powers of description). Although we got a good look at everything it wasn’t until much later, when the restaurant was almost full, that you realised what a lovely room it was with the warm light diffusing through those shades and all that chatter. The menu looks longer than it is, because a lot of the dishes – especially the couscous and tagines – are variations on a theme. It also has a good selection for vegetarians entitled “Vegetarian Corner”, which struck me as slightly unfortunate phrasing (although what the salad de crevette was doing on there I have absolutely no idea). The service throughout was absolutely flawless, and it began when we were deciding what to order. Our waiter, the only person serving the whole room, perked up when I enthused about Marrakech and then we discussed the wine, the different tagines, his recommendations and some of the other businesses his family had back in Morocco. For starters, there was a pitched battle (well, more like a slight falling out, given that I won) over who got to have the bastilla. If you have never had one before I’d urge you to call shotgun on it before you arrive. 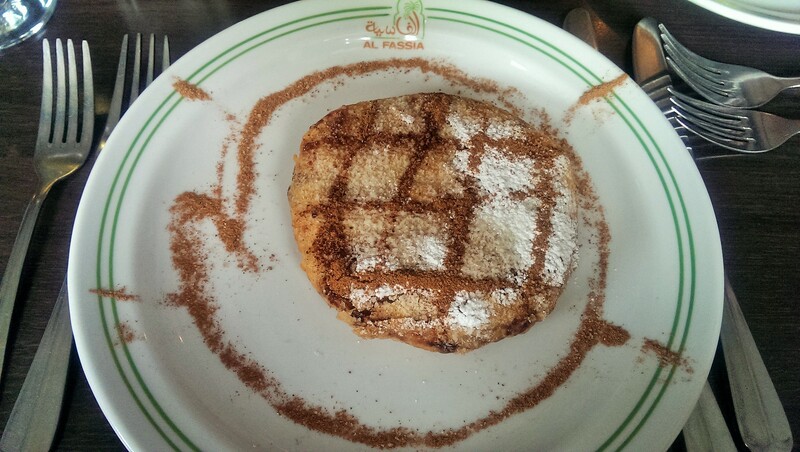 It’s essentially the Moroccan version of a pasty: filo pastry filled with layers of chicken (or pigeon, though it was chicken in this case) and almonds, sweetened and flavoured with cinnamon and other spices, folded into an octagon and dusted with – yes, you read this right – icing sugar. As if to congratulate me on my choice the waiter told me just how much work goes into one. He said that it was the single most difficult and time-consuming dish to make – the filo is hand-made on site, the almonds are cooked and skinned by hand and the chicken is slow cooked and shredded before going into the filo to be baked. Worth all that effort? Without a doubt. It was fantastic – buttery, sweet and savoury with the rich stickiness from the chicken and the sugar, all wrapped in the thin, crisp pastry. You have to be able to get your head around that combination of flavours, but if you can it’s unlike anything else you’ll eat this year. I absolutely adored it – oh, and it’s quite a monster so there’s even enough to give someone some of yours as a consolation prize, if they ask you nicely. The other starter, the mergas, couldn’t live up to that and it didn’t. 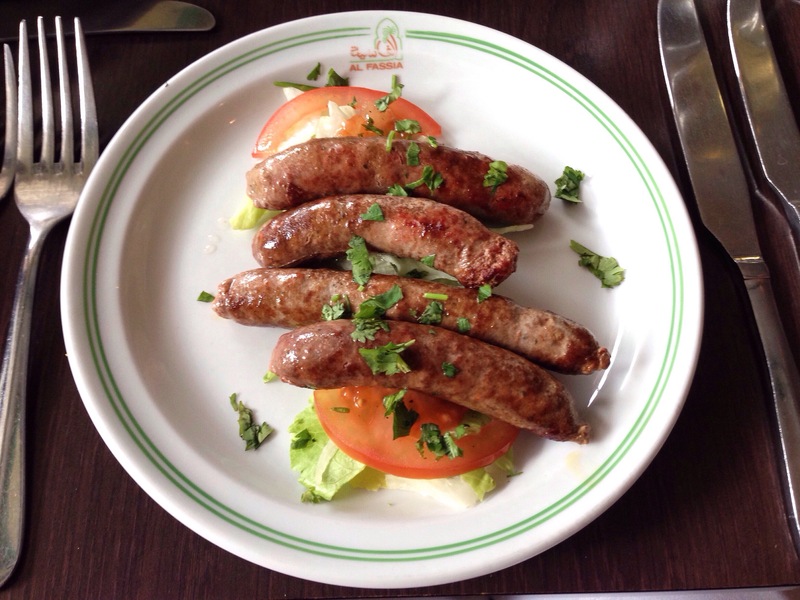 Four very generous lamb sausages, on a layer of needless lettuce with some pitta to wrap round it. The sausages – quite a random quartet, all different sizes – were beautifully coarse, meaty without being bouncy or dry, but the heat I associate with good merguez just wasn’t there. It was almost as if they knew they were in Royal Windsor and had decided to be on their best behaviour, and although it would have been suitably unthreatening for anyone in red trousers I wanted something with a lot more punch. Ironically when I was in Marrakech I eventually grew tired of tagines (having them every night gets a bit much after day three) but in Windsor not having one would have been unthinkable. 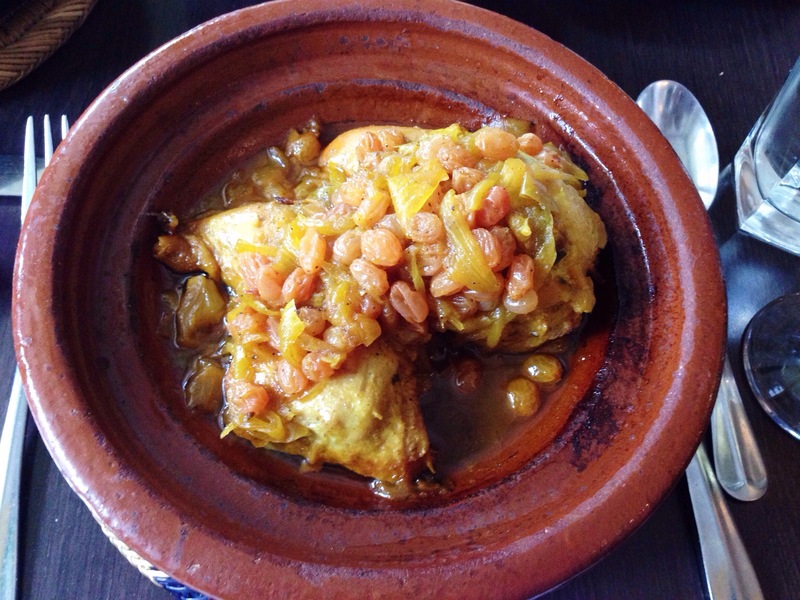 We took the waiter’s advice – bang on, as it turned out – and tried two chicken tagines. Both featured half a chicken, jointed, cooked until it fell off the leg with next to no encouragement, the breast moist and easy to pull apart. But beyond that they couldn’t have been more different. Tagine djaj aux poichiche was cooked with onions, spices and chickpeas, a rich and savoury affair with a lot more substance to it because of those slightly floury chickpeas. On the other hand, tagine djaj tfaia dialled up the sweetness to eleven, with plump, intense golden raisins and almost translucent ribbons of sweet, caramelised onion. After a few minutes of taking all the meat off the bones we were ready to stir in the couscous and eat in rapt, happy, nostalgic silence. All that for less than twelve quid. To drink we had a bottle of Moroccan sauvignon blanc. Yes really, Moroccan wine! Actually, I recognised this particular wine from my visit to Marrakech so went out of my way to order it – for all I know that meant it was Morocco’s answer to Blossom Hill but fortunately I’m too ignorant to know better. Besides, it was lovely and fresh with a little hint of apple and a large hint of less than twenty pounds (I have a feeling I’m coming across as quite the Philistine today – and to think they say travel broadens the mind). Following the mighty bastilla and the hefty mains we weren’t sure we could manage dessert. So we were preparing to finish our wine, enjoy the restaurant in the last of the sunshine and ask for the bill, when something unprecedented happened. A freebie. I can only assume that after chatting to the waiter (who, judging by the website photos, might well be the owner) he took a shine to us. Or maybe he does this for everyone, and I’m just deluding myself. Either way, he patted me on the shoulder and told me he was bringing something special over. I feel I need to declare this now, lest you think I’m swayed by the restaurant’s generosity (although let’s face it, I probably am – who doesn’t like free stuff?). A few minutes later a plate arrived with a large disc of that home-made filo pastry, sprinkled with finely chopped almonds, honey and cinnamon, finished off with three little spheres of vanilla ice cream. It was a lovely dish – just simple enough, just interesting enough, nicely balanced – and a lovely gesture at the end of a very nice meal. But, in the interests of balance, it looks from the menu like it would have cost eleven pounds were I to have ordered it myself, and I’m not sure it was quite worth that. No Moroccan meal would be complete without mint tea, served in those pretty little glasses, so we duly obliged and ordered some to finish off. As is traditional the waiter served this on a silver tray, with the tea poured from on high (no, I don’t know why they do this. But I like it). Sweet and minty, this had as much energy in it as a cup of coffee, I’m sure – I’d be reluctant to declare it to my dentist, anyway. It felt like the right way to bring things to a close before reluctantly leaving the premises and coming to terms with the fact that we weren’t in hot, exotic Morocco but rather in slightly cooler, slightly more homely Windsor. Dinner for two came to sixty-one pounds, not including service. I still wonder when I’ll get to go back to Marrakech. And a more unlikely twin town than Windsor you couldn’t find, despite all the tourists nearly getting mown down by traffic, despite the plethora of tradesmen and women keen to part them from their cash, despite all the historic buildings and shops selling almost identical goods which some of us might class, in the nicest possible sense, as tat. I’ll return to Marrakech one day, I hope. But until then, there’s Al Fassia: worth travelling out of town for, worth catching the train to. There may not be tables out on the terrace, there may not be fans on every seat and you might not find yourself misted with cooling water every few minutes, but even so I really do recommend it. Sometimes, a restaurant is the best travel agent there is. Cafe Madras was closed as of January 2018. I’ve left the review up for posterity. One thing I’ve not yet acquired, despite writing this blog for nearly two years, is that unshakeable self-belief that many proper restaurant reviewers have. I really do envy them; it must be lovely to be so certain that you’re right about good food and bad food. I’m not even able to fake that, so every time someone visits a restaurant based on a good ER review and likes it, I feel like I’ve dodged a bullet. And when I don’t enjoy somewhere, I always wonder whether it’s just me, whether the off-day was mine rather than the kitchen’s. Eating at Café Madras this week reinforced all of those suspicions: I didn’t enjoy it, but it felt like I could find at least a few reasons why that might have been my fault. For a start, I over-ordered – three starters and three mains between two seemed like a good idea on a ravenous school night, but by the end of the starters I could already feel a creeping, heavy fullness that left me uncertain about how much headway I would make into the main courses. 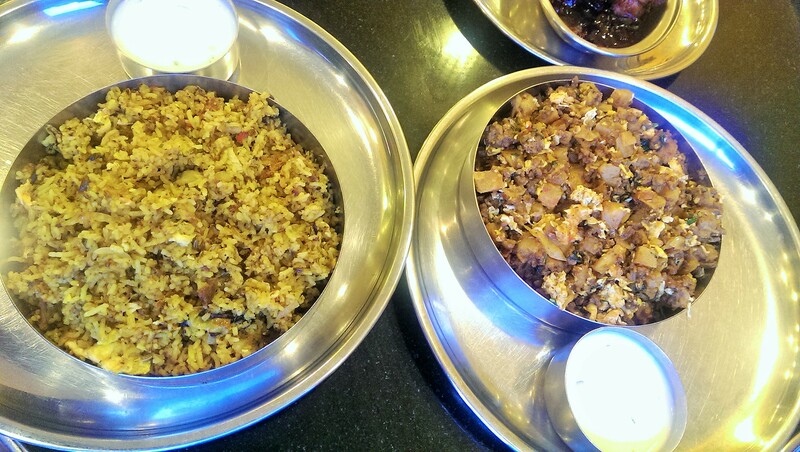 Also, at least a few of the dishes were similar enough that you could argue that I’d just chosen badly – kush ka fried rice, a dry dish full of onions and spice and little shreds of what looked like lamb felt very similar to the lamb kotthu, another stainless steel bowl of broken up paratha, minced lamb, onions. Both dry (even with the accompanying bowl of yoghurt), both slightly heavy going. When I left disappointed and walked down the hill into town, I felt uneasy that maybe I had let the restaurant down rather than vice versa. After all, the service had been lovely throughout – the man serving me was friendly and interested, suggested dishes from the specials menu and looked after us brilliantly. The room, although basic, was nice enough and had a steady stream of customers, some solo diners, some smaller groups of friends or couples, one large family. At least a few appeared to be repeat visitors. The site itself, up at the top of Whitley Street, has a complex history. When it opened as Chennai Dosa in 2009 Reading had seen nothing like it. People queued round the block to get in for authentic, inexpensive South Indian food. Then Chennai Dosa moved into the centre and, for reasons I can’t entirely remember, the site rebranded as Café Madras in 2011. Last year it had the dubious honour of being one of Reading’s only restaurants with a zero star hygiene rating from the council – since then it has come under new ownership, turned that rating around and is clearly trying really hard to live up to its original promise. So, there you go: I’ve outlined lots of reasons why I could pull my punches. And it would be really easy to do that, because nobody enjoys criticising an independent restaurant, especially one where the service is excellent. Especially one, for that matter, in an area like Katesgrove which is crying out for some – any – good neighbourhood restaurants. But it all comes down to the food, and the more I thought about it more I realised that there was something disappointing about nearly everything I ate that night. So Gobi Manchurian, for example, wasn’t the delicate delight it can be (and is, at other restaurants in Reading) – the batter was thick and heavy, the florets of cauliflower underneath just a little too hard. The oily slick of sauce at the bottom of the bowl made me wonder just how much fat was sloshing around in my stomach. Similarly the special chicken tikka – recommended by the waiter – sizzled attractively and some of it was nice enough, but the inside of a couple of pieces, though certainly not raw, was firm and bouncy in a way that chicken tikka really should not be. 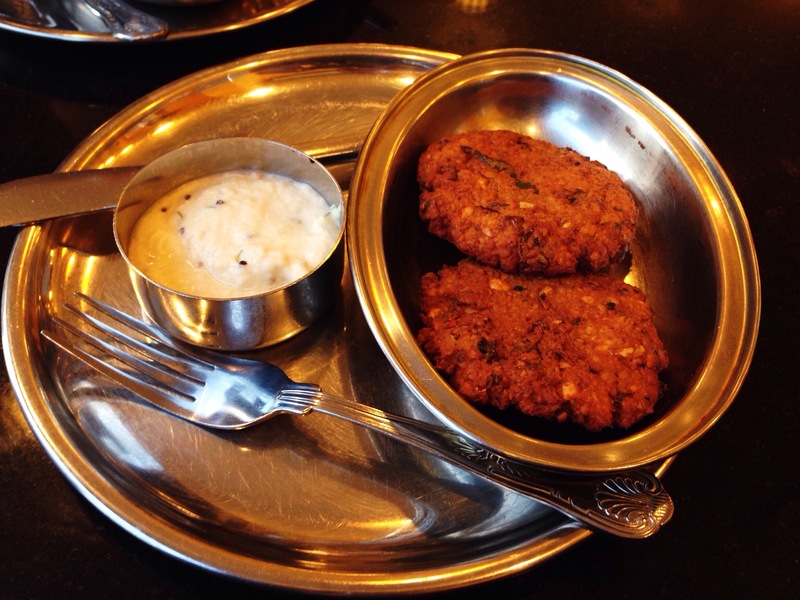 Only the masala vada – circular lentil patties, like flattened bhajis – bucked the trend, being crispy, nicely spiced and beautiful with the thickened yoghurt on the side, speckled with nigella seeds. That was the only dish we finished all evening. Even if I hadn’t been approaching full at high speed, I still think the main courses would have disappointed me. I could see that lamb kotthu might have been wonderful warming food if you’d grown up on it, an exotic cousin of the shepherd’s pie, sticky and rich. But it was just a tad too claggy and almost sweet, and the big chewy lumps of paratha felt like harder work than I associate with comfort food. Paneer masala, deliberately chosen as a meat-free main, had a lovely smoky sauce but, again, was a little too oily for me to feel like making significant inroads. We counted around half a dozen not very large cubes of paneer floating in it. By the end it had degenerated into a vegetarian fishing expedition bobbing for cheese, one about as successful as most fishing trips. The best of the mains was the one I had lowest expectations of – the fried rice was packed with seeds and spices, onion and egg, small subtle strands of lamb (and a little shard of bone, as it happens). It was gorgeous and complex, with a heat that kept on growing and developing. But I didn’t really appreciate it at the time – only a couple of days later when I took my leftover rice to work (the waiter having kindly packed it up for me) and microwaved it in the kitchen did I realise just how good it was, mainly because of the envious remarks from my colleagues who were ploughing through their frigid, miserable supermarket sandwiches. But reheating my memories of the meal didn’t have the same happy consequences: it was still far more misses than hits, even if my aim could have been slightly better. The meal – three starters, three mains and the grand total of four slightly too smooth, slightly synthetic-tasting mango lassis – came to thirty-four pounds, not including service. A cheap meal, and one that could have been even cheaper, but even at that price a curiously underwhelming one. One of the big questions I ask myself when reviewing a restaurant – usually at this point in a review, as you may have noticed – is “would I go back?” If Cafe Madras wasn’t so far out of town, or if it was in my neighbourhood, I think I probably would. And I’d find the things on the menu that suited me better, I’d get to know the staff, I’d take their advice, and it could be a restaurant I’d learn to love. If you live in Katesgrove, you may have learned to love it already. But it isn’t any of those things, and the South Indian restaurant that is in the centre – Chennai Dosa – moved there from this spot, for very good reasons. So would I go back? The answer is the most frustrating one of all: nearly, but not quite. I don’t have the unshakeable self-belief to tell you not to go there. But I can’t recommend that you do. Although most ER reviews are of independent restaurants, I’m not against chains for the sake of it. Not all chains are the same: there are big and small ones, good and bad ones – just as there’s a difference between the silver chain you’d hang a pendant from and the lunking great thing you’d use to secure your bike to the railings. I was struck by this wandering round Henley on a sunny Bank Holiday Monday, because they have chains just like Reading does, only different ones. So there are shops like Space NK and Joule’s – the next tier up, you could say, places in the same bracket as Jigsaw and LK Bennett. It’s the same with cafés and restaurants, so Henley has a Maison Blanc, a Hotel du Vin, and a CAU. I did briefly consider going to CAU to find out what we had to look forward to when the Reading branch opens this month, but nothing about the décor appealed: the nasty rigid white chairs and sterile banquettes screamed “downmarket Gaucho”. Besides, I was on my way to a more intriguing phenomenon: Giggling Squid has grown from a single branch in Hove six years ago to a chain of thirteen restaurants (many of them opening in sites which used to belong to other chains – a handful used to be branches of Strada, Henley’s was previously an ill-fated Brasserie Gerard). And there are more on the way – the management wants to make this the first nationwide Thai chain, with plans for somewhere between fifty and eighty sites. It’s funny how, despite the popularity of Thai, Indian and Chinese food they still tend, by and large, to be chain-free zones (unless you count the delights of Ken Hom’s Yellow River Café, one of the Oracle’s first ever tenants way back when). I’ve never understood why that is – was Giggling Squid going to challenge that status quo? It’s a lovely old building at the bottom of Hart Street and it’s been done up very nicely. On the way there I walked past Henley’s long-serving restaurant, Thai Orchid and it was the picture of an old-fashioned Thai restaurant, all dark wood, ornate panelling and intricate, inlaid, glass-topped dining tables. Giggling Squid couldn’t be more different, with its pale walls, exposed beams and almost Scandinavian bleached bentwood chairs. The front room, where I sat, was more traditional – the big room at the back was much better lit and I’d rather have sat there, but I didn’t have much choice in the matter. Which brings me to the second thing I noticed about it: it was absolutely rammed (I was lucky to get a table at all without a reservation, and quite a few couples who came in after me were turned away). Giggling Squid bills itself as “Thai Tapas & Thai Restaurant”. The idea of anything other than Spanish food describing itself as tapas makes me feel a little exasperated, but what it essentially means is that at lunchtime, rather than having a traditional a la carte menu the main options are one of six “tapas sets”, each of them a mixture of three different dishes and jasmine rice. You can order lots of tapas separately instead, although I’m not sure why anyone would unless you really disliked the set combinations, or you can have what they describe as “one big dish with rice” or a “two dish meal combi”. 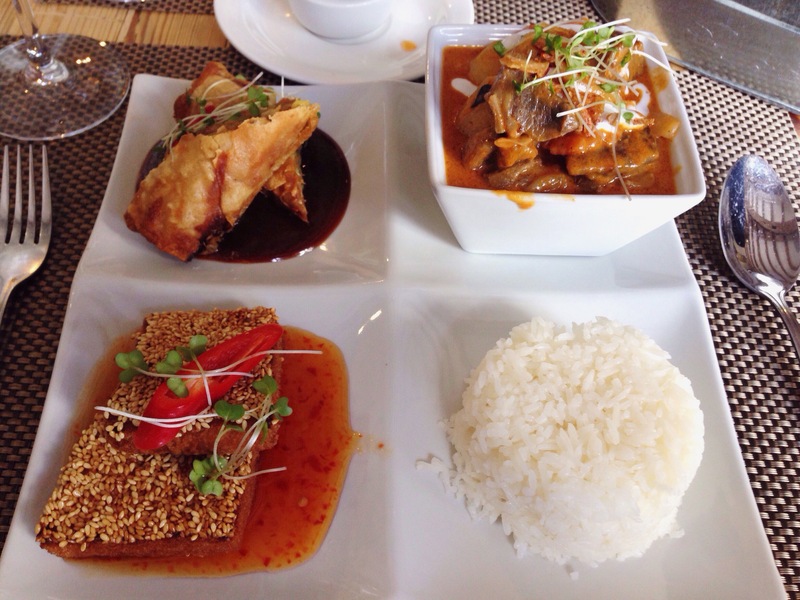 This all felt overly complicated for me – did I want one big dish, two middling dishes or four small dishes? was there an option of having eight minuscule dishes? – so we went for a tapas selection each. And some prawn crackers. And some chicken satay (which by my reckoning makes a total of ten small dishes, sort of). Despite the restaurant being extremely busy everything arrived very quickly indeed. Prawn crackers came in a metal pail and were good but unexceptional. 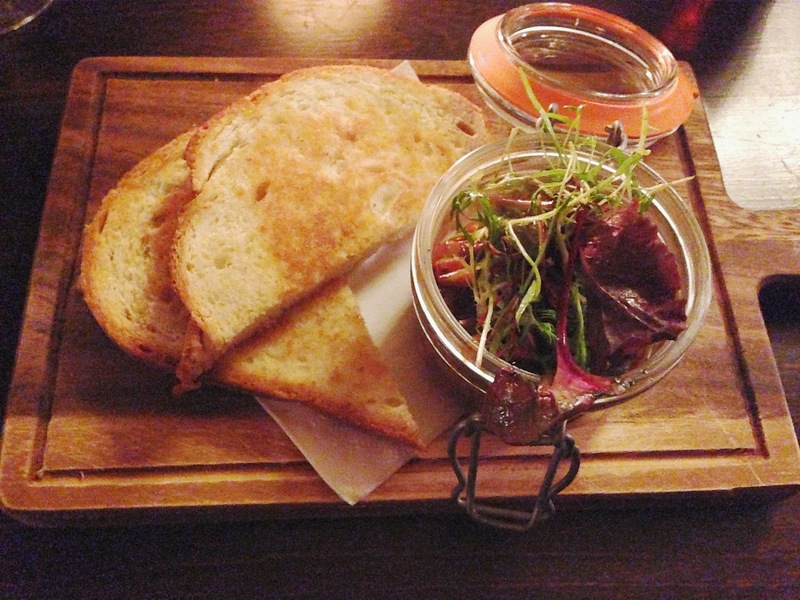 It was a huge portion of crackers and an absurdly tiny ramekin of sweet chilli sauce – I couldn’t help feeling I would have liked less crackers and more dip, but they were pleasant enough and lasted just until the rest of the food turned up. So, on to the tapas (if I really must call it that) itself: a square plate divided into four with something different on each section. Much as I might have wanted to turn my nose up at the concept I couldn’t fault the food. Shredded duck spring roll was a huge thing, full of dense strands of duck, served on a surprisingly subtle puddle of hoi sin that wasn’t just relentless sweetness. Prawn toasts were much better than I expected, crispy and light with a gorgeous layer of toasted sesame, served with more of the sweet chilli sauce. Salt and pepper squid was not at all chewy and the batter was beautifully light (maybe too light, as it did fall off the squid the moment it was challenged with a fork) served on another puddle of sauce – this time hot chilli with no sweetness. The beef salad was the cousin of the chicken salad I raved about from Art of Siam – soft, tender strips of beef on top of a bowl of salad filled to the brim with hot, sharp, sour sauce. It was agony and ecstasy to eat and would be perfect for anyone with a bit of congestion – the heat would soon clear that up. 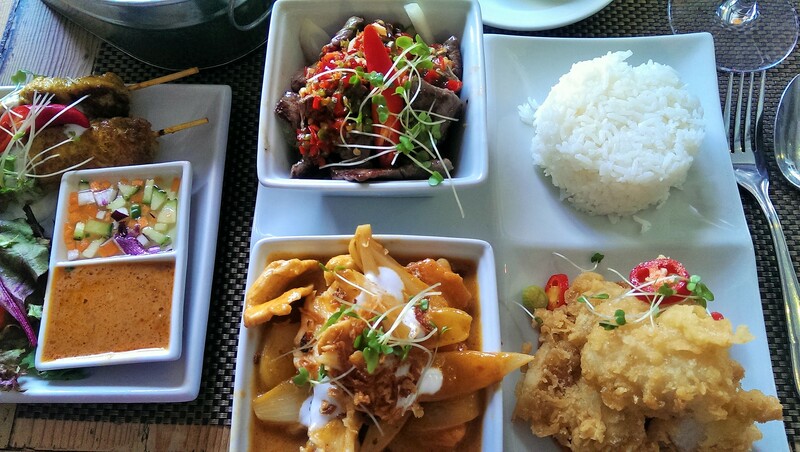 Because of the set combinations we’d gone for (“Two Giggling Squids” and “Wealthy Squid”, I have no idea why they’re called that, so don’t even ask) we had massaman curry two ways. The lamb was gorgeous, slow cooked and reassuringly free of wobble and the chicken was in tender, slender slices. There were nice firm chunks of potato, lots of onion and a healthy (or unhealthy, depending on how you look at it) sprinkling of crispy fried onion on top. The sauce was perhaps a little subtler than I’m used to but still went beautifully with the rest of the rice – and I’ve always thought, and said many times, that the rice and sauce at the end of a Thai main course is the best bit. The chicken satay, ordered as an extra out of curiosity, was probably more food than we needed but again, it was very good: tender, soft chicken, not dried-out fibrous breast meat, easy to slide off the skewers and dunk in a fresh clear dipping sauce or a spiced but fragrant satay sauce that was a lot more than hot Sun-Pat. We finished the lot, although it put paid to any plans I had for dessert – a pity, as I had my eye on the black sesame ice cream. Still, there’s always next time. The menu, come to think of it, was full of little flashes of personality like that which made it feel a lot less like a chain. That really came across in the wine list in particular which managed that rare trick of getting a slightly irreverent tone without making you want to cringe. Written by the co-owner, it compared the Chardonnay – described as something like “rich and fruity” – to her husband before mentioning the extensive research he had done trying to find some reds that went with spicy food. That sort of thing might make your toes curl, but I found it oddly charming (oh, and we had a couple of glasses of the Chardonnay: if her husband is anything like that she could have done an awful lot worse). Service was harried but friendly. It felt difficult to get attention right at the start, but given how popular the place was I was impressed by how efficient they were; at the end, when the lunchtime rush was fading out, the waiters were a lot more friendly and interested. We went from sitting down to being out of the door in just over an hour which I think is fair enough on a busy lunchtime, especially when you’re only really having one course. Lunch for two – two tapas sets, prawn crackers, chicken satay and two glasses of wine – came to £40 with a semi-optional 10% service charge on top. The tapas sets were just under £12 each, which I thought was pretty decent value. The owners of Giggling Squid have talked about Côte as the chain they’d like to emulate and I can see why – it’s a great example of how a chain can get everything right and be consistent without being faceless. And I think Giggling Squid does that too; I liked almost everything I had, it’s a lovely spot, it’s very tastefully done and the service is good. I do wonder, though, whether the reason they haven’t chosen to target Reading is that it already has three well-established Thai restaurants with good reputations – the kind of day-in, day-out consistency that is the brand promise of most chains. I wonder too what Giggling Squid will be like if it hits its targets, has a hundred branches worldwide and takes over all the vacant Stradas, Bella Italias and Café Rouges out there. But that’s all years ahead: in the meantime, it’s worth going so you can say you were there in the early days (or back when it was good, depending on how it all turns out). I might see you there, because the whole experience made me want to go back – partly for that sesame ice cream, but mainly to try the evening menu, which is so packed with tempting-looking fish and seafood dishes that I literally wouldn’t know where to start. N.B. O Beirão closed in October 2015. I’ve left the review up for posterity. Dining at O Beirão is a little like eating out on holiday. To start with it’s a bit of a trek, up out of town and then down the Basingstoke Road, where it’s all pretty Victorian houses and car dealers. With a location like this you have to want to visit, because there’s no chance of happening upon it. Then there’s the poor website with a few spelling and grammatical errors and, crucially, no mention of the opening hours. Checking this out for information can be misleading and you might turn up, like I did the first time I visited on duty, on a day when they’re not actually open, making the trek seem rather futile (thank goodness for the decent bus service, as there are no runners up to review round here). Then there’s the telly up in the corner of the room showing European football – Portuguese, of course – much like many little tavernas and bars on holiday. Finally, and this is not a good thing, after trekking out of town to visit O Beirão I dashed to the toilet to be greeted by a sign saying “Please do not flush toilet paper. Please put it in the bin”. It was Crete 2002 all over again. Don’t let these things put you off, however. Inside this little slice of Portugal is really quite nice. Having turned up previously when the shutters are down it would be easy to dismiss it as a rough, out of town restaurant that won’t be around forever, but what’s actually behind the shutters is an adorable room filled with small tables with red gingham tablecloths and terracotta crockery (which includes the wine cups). The menu is pretty short and hints at a double life. There is a pretty standard selection of lunchtime foods (omelettes, sandwiches, jacket potatoes – presumably to make the best of those car dealers wanting something decent for lunch) along with the authentically Portuguese dishes. Some of the main courses need to be ordered in advance – if only I’d known that I might have gone for one (the arroz de marisco sounds especially good, as does the suckling pig), but turning up on spec meant it wasn’t to be. Besides, they weren’t listed on the website either. 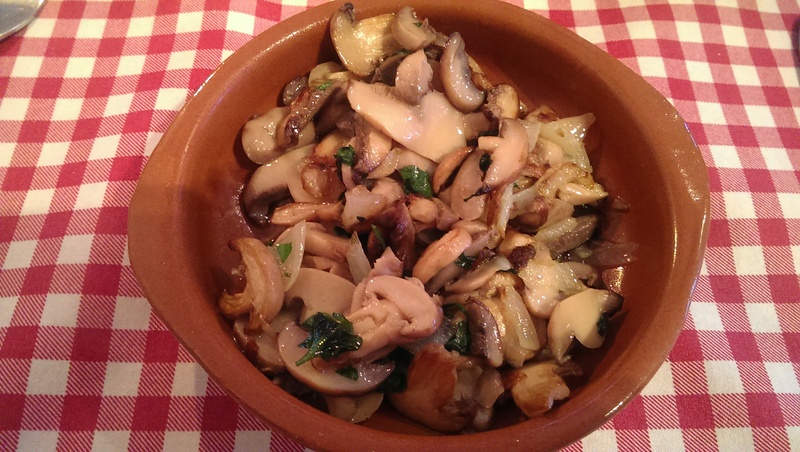 I started with pan fried mushrooms with garlic and onion, and morcela (Portuguese black pudding), both of which turned up in more terracotta pots. The mushrooms were respectable, fresh tasting and decently garlicky, though I would have preferred them more thoroughly cooked – they were a little flaccid, not at the wonderfully sticky stage of truly great fried mushrooms. The morcela – a generous helping – was again very much on the basic side. I’m a huge black pudding fan and I think I was expecting something soft, sweet and crumbly like Spanish morcilla but this wasn’t it – much firmer, much more like a hybrid between black pudding and chorizo. Again, I felt it could have been cooked a little bit better, and it was very hard to separate from the skin. Both starters were accompanied with a basket of bread and butter and a small tub of shrimp paste (you can thank Google Translate for that nugget, otherwise I wouldn’t have had a clue what it was: Portuguese is not one of my strong points). There were two types of bread – the first, delicious and chewy, resembled sourdough in texture and was great dunked in the mushroom juices. The second was more like corn bread: shorter, sweeter and a little bit odd (especially with the shrimp paste – take my word for it, that’s a combo that shouldn’t be tried). 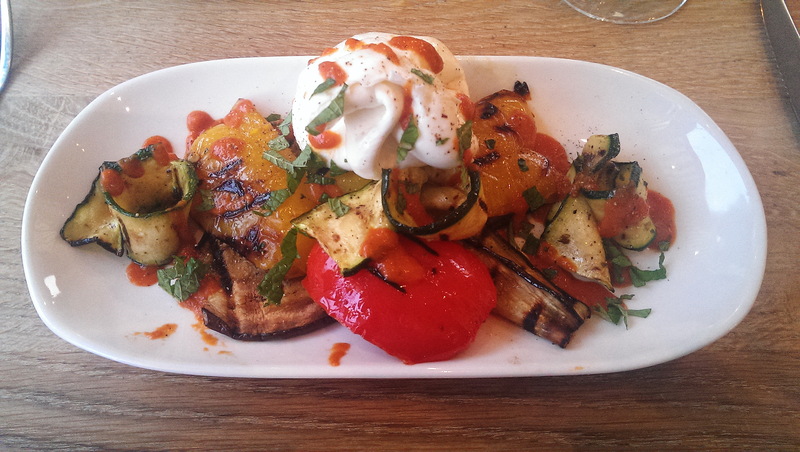 Both starters were four pounds, which, to me, is on the borderline between “very reasonable” and “downright cheap”. So far, so not bad. 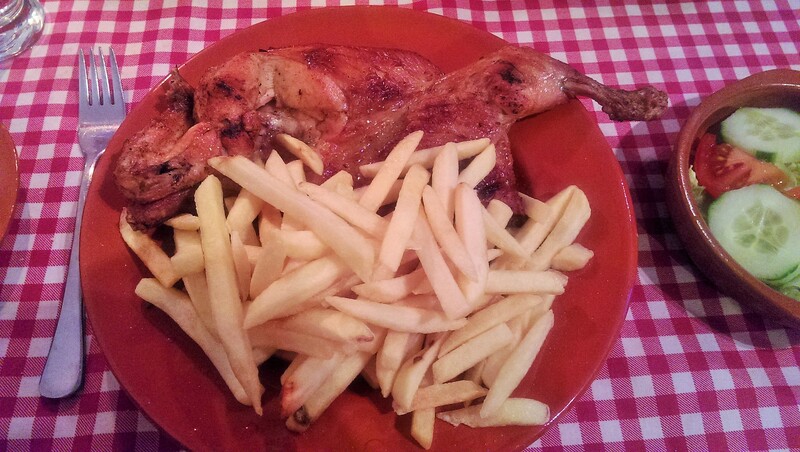 For a main course it would have been a crime not to order the frango assado (piri piri chicken), so I did. This is true Portuguese chicken (if you’re ever been to Portugal you’ll know what I mean) with a crispy skin, a lightly spiced kick and with meat pulling away from the bone easily. I asked for it medium and in truth it was a bit under-spiced for me, so I was splashing on a little extra piri piri sauce from the bottle on the table (which I loved and would quite happily have slipped in my pocket to bring home. No! Of course I didn’t!). Of course, it’s not possible to talk about piri piri chicken without mentioning Nando’s, so here goes: the heat was drier and more subtle in O Beirão’s version, and for what it’s worth I preferred it. On the side were an awful lot of fries (nothing special, and almost certainly not made on site but very good at soaking up the juices from the chicken) and a simple salad of lettuce, tomato and cucumber which I barely touched, truth be told. At the end of the meal I really wanted to pick up the chicken and get the last bits of the meat off with my bare hands but decorum got the better of me. I still regret that a little bit. The other main course, bacalhau com natas, sounded intriguing. 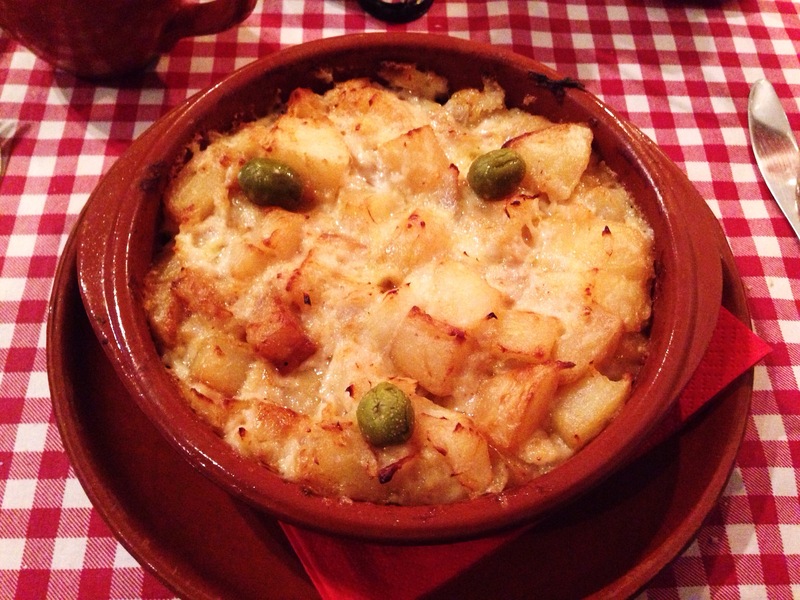 I love salt cod in all its forms, and I liked the idea of it being served with fried potatoes in a béchamel sauce. Unfortunately, it didn’t live up to that promise. It felt a bit like a Portuguese take on fisherman’s pie, but the whole thing was far too creamy and bland: the béchamel drowned everything else out and, ironically for a dish built around salt cod, what it was really crying out for was some salt. Every mouthful just highlighted what a good choice the piri piri chicken had been, and I would have traded the whole lot for just another forkful of salted, crispy skin. 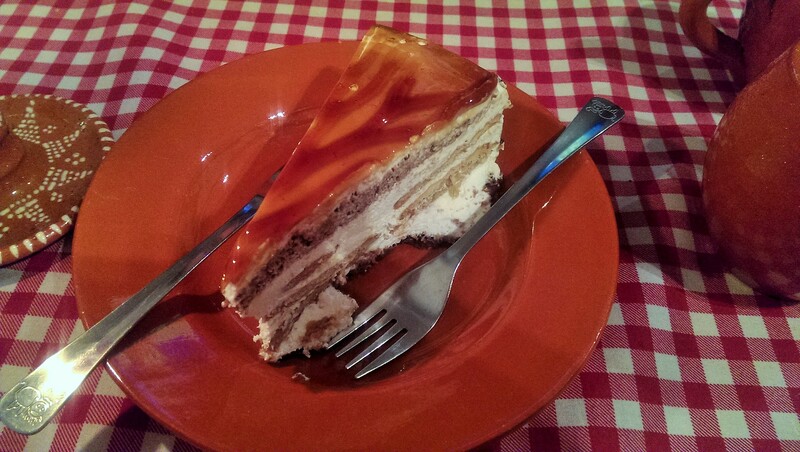 To finish we shared a slice of toffee biscuit cake. 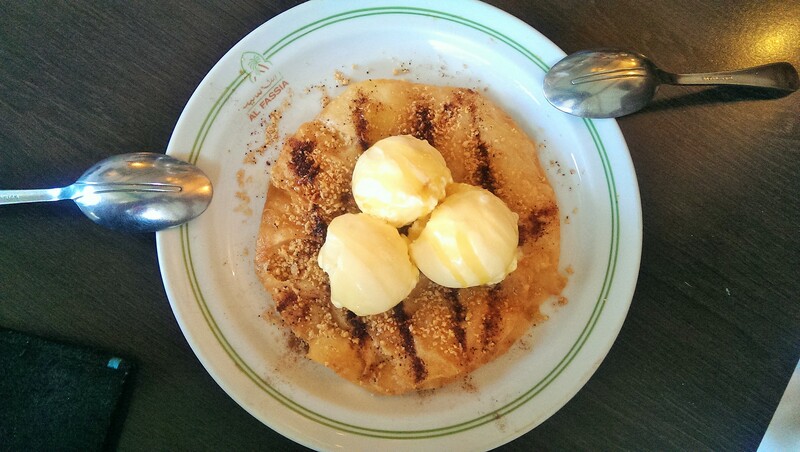 According to the O Beirão website all the desserts are made in house, though this looked a little too perfect for that to be true. This was a bit like tiramisu – layers of strangely firm, soft biscuit and what I think was crème patissiere, all with a toffee sauce on top. As enjoyable as it was the cream layers were slightly synthetic tasting, a little too sweet and thick. Of course we finished it but I would have preferred a pastel de nata to end the meal. That might be a bit of a cliché, but I absolutely love them. Impossible to tell whether O Beirão ever sells them, though (the wonders of that impenetrable website again). The wine list here is pretty short (and yes, they do serve Mateus Rosé) and very reasonable. We had a half litre jug (and, as I’ve probably said countless times, I really wish more places would do carafes) of the house red and it cost just eight pounds. I thought it was smashing – juicy, jammy, fruity and great for drinking with spicy food. It’s also nice to see that all the wines on the list at O Beirão are Portuguese and none of them are over twenty pounds (the most expensive are just sixteen quid). They also do two perfectly respectable-looking ports by the glass – one vintage, one tawny – although I didn’t get to try them this time. Service throughout was polite and friendly, with just the one black-clad waiter looking after the room. He was cheery and chatty although, truth be told, we didn’t need much looking after (it was the sort of quiet Friday night that makes me fear for a restaurant – only three tables of two all evening). The bill, for two and a half courses and a carafe of wine, was a touch under forty-five pounds, excluding service. Pretty hard to argue with that, I think, and although the bacalhau was a bit of a misfire a lot of it was good, all of it was cheap and most of it was both. If I’m honest I went to O Beirão wanting to like it (once I’d got over the frustration of turning up on a Thursday evening to find the shutters down). Yes, the hours are odd – they’re only open in the evenings Friday to Sunday, although they do lunch every day. Yes, it is a bit of a pain to get there (though the number 6 bus stops right outside). And yes, you can’t flush your loo paper. But it really charmed me, and I think that shows that sometimes it’s not just about the room, or the service, or the food. Sometimes there’s some other indefinable quality, and O Beirão has that. Perhaps it’s that feeling of being elsewhere, a feeling many far more expensive, more polished restaurants throw money at manufacturing without success. For an independent Portuguese restaurant to open in Reading is no mean feat, let alone one in the relative obscurity of the Basingstoke Road. They’ve been there since the end of 2012 and I for one would like to see them stick around, even if it’s just for an alternative to the relentless march of Nando’s. Next time I’ll take some friends, pre-order something that takes a little longer to prepare and order a bottle of Mateus Rosé. Or several. Judge all you like, because I won’t care: I’ll be on holiday, after all. No new review this week I’m afraid, because I’m taking my first week off of 2015. Instead, you get a feature: I’ve had a few people express interest in ER features from time to time, so this is the first of its kind. I’m very lucky that I get to eat out often and write weekly independent restaurant reviews; I genuinely believe that the only way restaurant reviews can be totally impartial is if the person writing the review is also the person paying the bill. But I’m also painfully aware that eating out is a luxury that not everyone can afford. This week, I’m donating the cost of the meal I would have eaten to Launchpad, Reading’s homeless charity which does excellent, tireless work which is needed more now than ever. ER is free to read and it always will be – but if you felt like donating even the smallest amount of money to Launchpad too, I’d really appreciate it and I’m sure they would too. Normal service will be resumed next week – until then, on with the feature. Summer is around the corner – the Reading Beer Festival always feels to me like the first sign that it’s on the way – and that always makes me think about the delights of eating outdoors. We all daydream about barbecues, we have our tea and coffee at pavement tables people-watching and relaxing and suddenly a whole different criterion comes into the decision-making process when you’re deciding where to eat. After all, it would be a shame to have lunch or dinner cooped up when it’s glorious outside. It really frustrates me that good al fresco dining spots in Reading are few and far between. The town seems to be full of blind spots where the sun just doesn’t shine, and many of the plum spots are filled by disappointing chains. Bill’s, for instance, has an absolutely gorgeous space outside which is a magnet for UV rays but the food doesn’t live up to the setting. It’s quite nice for breakfast (eggs sunny side up in more ways than one) but otherwise it just doesn’t do it for me. The Riverside gets lots of sun and many of the venues have decent outdoor seating but it’s hard to be excited by them – the little tables outside Cote always look inviting, but All Bar One, Bella Italia, Pizza Hut and Nando’s aren’t quite so alluring. So – and I might be jinxing the summer of 2015 by even saying this – the days are long, the shadows are too, it’s short-sleeves weather and you’re ravenous. Where to go? It did cross my mind to pick the balcony at Jamie’s Italian, looking out over the throng of Oracle shoppers. But, for food and service, Dolce Vita easily has the egde. It’s as close as you can get to the Oracle view without actually being in the Oracle, tucked away from the hubbub. The balcony area extends out on two sides of the restaurant and the menu is equally sunny with Mediterranean food – and some more leftfield choices with traditional British and even Asian influences – and friendly, charming Greek service. 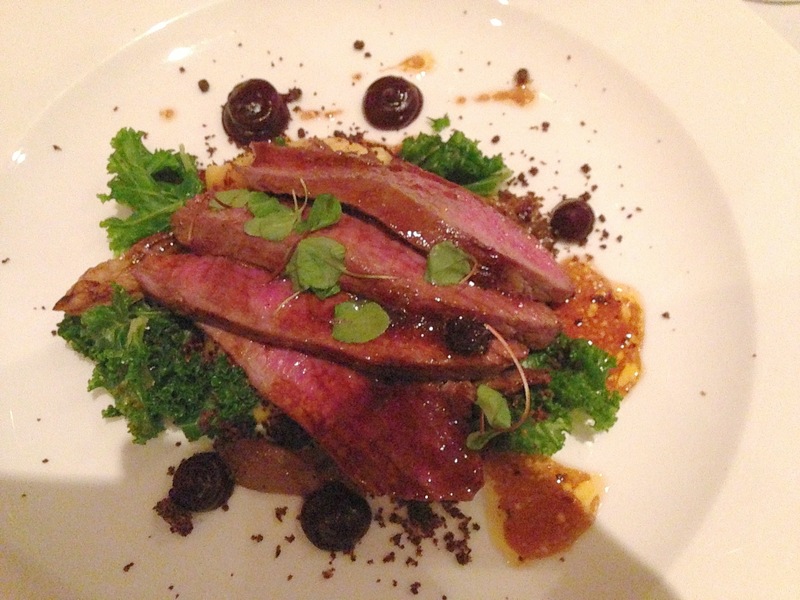 The set menu, which is often on song, offers great value and a surprising range of options. When I sit outside at Dolce Vita I can almost convince myself that I’m on holiday, especially if I’m drinking a pint of Peroni or a fresh, fruity glass of rosé. Ideally one would arrive at the Plowden in an open top sports car, passing some of the rolling green hills that the Berkshire/Oxfordshire border has in spades. The generous garden at the Plowden offers a lovely view across the countryside with added waitress service and decent umbrellas, should you be more English rose than suntanned millionaire. The food here ranges from substantial and traditional to delicate and sophisticated (and the kitchen is consistently brilliant at all of it) but everything is fresh, creative and sometimes based on old English recipes, in case you fancy a side order of education. Having your dessert outside by candlelight, the last rays of the sun not long faded, is a pretty magical way to finish an evening. Picnic has one of the best spots in the centre of town, having taken over the old Jacobs shop eight years ago. The tables outside catch plenty of sunshine (especially early to mid-afternoon) and, provided the wind isn’t blowing a gale, it’s a great place to enjoy lunch and some of Reading’s best people watching. The salads have always been the draw here – leaves and couscous with a weekly range of toppings – and although I’ve found the interior much harder to love since they moved everything around, it can’t be denied that it has freed up the space for the kitchen to add yet more interesting variations on that theme (that said, I still have a soft spot for their roast chicken and pesto). If you scoff at salad, even in summer, there’s also a lot to be said for their cracking Cornish pasties and sausage rolls, from award winning Green’s of Pangbourne. Oh, and the cakes are magnificent: good old-fashioned Victoria sponge and terrific, moist lemon polenta cake are my favourites. All that and a view of Munchee’s opposite (what more could you want?) – no wonder, whenever I bag a table outside, I feel so reluctant to leave. London Street Brasserie has probably the nicest terrace in town, alongside the Kennet. When it catches the sun it really catches the sun, and in summer the menu – always nicely seasonal – really rises to the occasion. There’s nothing quite like making inroads into a crisp bottle of white and enjoying a half pint of prawns, easing off the head and shell before dipping that firm flesh into their peerless garlic mayonnaise (writing about doesn’t even come close: I’m hungry now). I generally find the set menu more reliable than the a la carte here (the fish and chips is another favourite of mine) which makes it perfect for a boozy weekend lunch, although if it’s not quite sunny enough or the afternoon is waning, they also do a nice line in chequered blankets and patio heaters. LSB is a good example of how the summer can change everything – on a winter evening it probably wouldn’t make any of my top fives, but when the sun is out it’s hard to beat. Forbury Square is one of the prettier, quieter outdoor areas in town and Forbury’s really makes the most of it (and in some style, too). Unlike the unluckily positioned Carluccio’s – which always feels like it should be sunny but never is – it is nicely lit and, unlike Cerise, the seating is plentiful and comfortable. 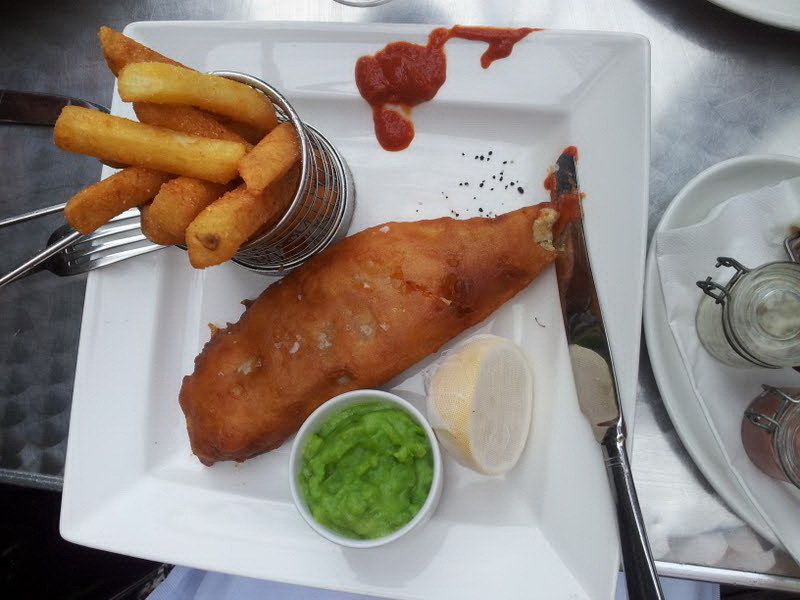 If you can manage to stick to their set menu (a challenge that many have failed, me included) then a three course meal can set you back as little as twenty pounds per head – and even less if you’re lucky enough to be there on a weekday lunchtime. Make sure you add some bread, though, as their sourdough is heavenly. Oh, and wear your best sunglasses and pretend you’re on the French Riviera. Air kissing optional. What is ER on about? you’re probably thinking. The Allied Arms is just a pub and it doesn’t do food. I know, I know, but bear with me. I picked this tip up from friends of mine a couple of years ago and it’s a cracker; although the Allied doesn’t do food, they don’t have a problem with you consuming food from elsewhere on the premises. So, on a summer night when the Summer Lightning or the Thatcher’s Gold is flowing, instead of wandering off to a restaurant just get someone to watch your table, pop next door to Pizza Express and then return with your Pollo Ad Astra or American Hot. It’s worth it for that first bite of pizza. It’s worth it for the crispiness of the pepperoni or the salt bomb of anchovy. But, more than anything, it’s worth it for the looks of envy you get from everybody else in the pub who wishes they’d thought of it. Last time I checked, the Allied even kept a pizza cutter behind the bar, although if word gets out they might start charging people to use it. If you like this and you’d like to read more of this sort of thing then let me know in the comments, and if there are any particular subjects you’d like to read an ER feature on then do say!